"That on the left-hand is No. 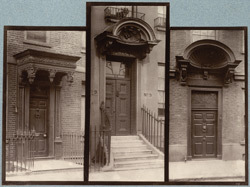 26, Queen Square, Westminster, perhaps the best example to be found here; another doorway on a similar scale being given in No. 114. At the side of No. 26 is one of the old extinguishers, used for putting out links or torches. The middle doorway is that of No. 9, Grosvenor Road, a name given of late years to what was formerly a portion of Millbank. It is hardly necessary to call attention to the very graceful character of the whole design. The doorway on the right is from No. 17, Delahay Street, given by Mr. Hare - I fear without sufficient authority - as that of Judge Jefferies' house. (Walks in London, ii. 226.) The house has been lately rebuilt, but the canopy is retained."